I'm not entirely sure... Perhaps Lin Bo is specific to Northern Shaolin and the Tan Toi series is more general to Kung Fu? I really ought to find out, because I have no idea.. Will get back to you on that after I've asked. Glad the tournament went well! AFAIK there’s no forms general to Gung Fu. Each of the styles has its own forms. When I was a child, I was learning Tae Kwon Do. I had a great instructor who I believe still teaches to this day, but the dojang we were all in was a bit too commercial for my tastes -- even as a kid I was a bit put off by it all. Now I'm taking Kendo in a small, friendly dojo of highly skilled Kendoka. I'm looking forward to doing Kendo for a very long time. Kendo! There's a kendo school in a town near me, and I've considered taking it, (especially since it's on a day when I'm free!) but my schedule this semester doesn't really invite any more non-homework-related activities. Maybe this summer, though! GwenElf wrote: :love: Kendo! There's a kendo school in a town near me, and I've considered taking it, (especially since it's on a day when I'm free!) but my schedule this semester doesn't really invite any more non-homework-related activities. Maybe this summer, though! I'm really happy that I took up Kendo, and I think the vast majority of people who show even a passing interest in it will take to it very nicely. If you're interested in pursuing a martial art, you will enjoy. In addition, if you have an affinity for Japanese culture and language, Kendo should whet that apetite well. It's one of the few martial arts that has maintained its integrity and for the most part has resisted attempts to commercialize it. Still, it happens, so just make sure that if you do take Kendo, that your dojo is a part of a reputable regional federation which in turn is a member of a reputable national federation which in turn is a member of the International Kendo Federation. Also remember that most should have very reasonable dojo fees, since it is a bit taboo to be making profit off Kendo. This forum is very helpful in getting more information. Cool a guild for Martial Artist! Okay sorry that sounds pretty silly. You 'll have to excuse I'm just a fresh little newbie, so I'm very excited. If I do something wrong just cuff me around the ear. Although you have to know that I can't guarantee what will happen next . Anyway it's nice to meet fellow Martial Artists. I'm a karateka myself ( Shotokan-style). I started when I was thirteen. I also hope to start with Modern Wushu after the summer holidays. It's very different from what I'm doing now but I like diversity . I started BJJ a few weeks ago. Belated hiya to Claymore! Welcome to the guild! I've not done any Kung Fu this summer (except for some chin na on my sisters last week ), and now I've hurt my wrist tubing. Not entirely sure how, but there you have it. Of course, that shouldn't prevent me from doing a lot of stuff, but it makes a better excuse than "I'm very lazy." GwenElf wrote: How do you like it so far? Very much. It's a very practical, no-frills style. Err excuse my ingorance but what does BJJ stand for? Claymore wrote: Err excuse my ingorance but what does BJJ stand for? Has it anything to do with Japanese Jiu-Jitsu? It’s a derivative (like Aikido, Hapkido and Judo). It’s based largely on the ground-fighting techniques of Judo (newaza) on which it expands a lot. It’s a grappling art, which has a reputation for being very effective on the ground as it’s practiced live. See wiki. I must admit that I know nothing of grappling martial arts except a few jiu-jitsu locks and some Judo tricks I learned from my little brother. I'm more familiar with kicking martial arts. I just started Wushu two weeks ago and it's just plain fun. The class is rather small and I'm training with folks who are already doing competitions and the like. The first time I came there I thought I would have to work very hard to catch up with the others but I discovered I was actually more or less of the same level as those who already had trained two or three years. Many basic moves from karate are almost the same as those in wushu and I already have a supple body. In fact the first time I started stretching a few of the newer students where looking at me with a look on their faces like: Jesus! That's not fair! My only problem now is to lose those little karate-quirks when I'm doing wushu. I'm now learning a stick-routine and so far I've managed not to slap myself to much with it. If I got it right it's a stick-routine from the southern style which means it's less acrobatic and more based on strength than the northern style. I've seen a guy a perform northern style stick-routine and it involves a bit more running, jumping and sweeping than what I'm doing. Learn everything, absorb what is useful, reject what is useless and add what is completely your own. too bad some persons ( in particular teachers) want you to to learn useless things. For those interesting, I’ve started a thread in Movies on Martial Arts in film. I fall more or less in the second category I think. I fence. I think I fall into the second category too and I started a thread in Talk but was told there was already one here. Does anyone know the "Pledges of Honour" (cf. t.114, t.116, t.120)? for foil fencing I need to know it for my gradings and can't find it on the internet. Excellent philosophy, it's also what my jiu-jutsu teacher keeps repeating to all of us, both the girls and the guys. No matter how good you are, in a street-fight nobody is gonna fight fair. You'll often be outnumbered, possibly outarmed, surprised and definitely not ready to face it so everything goes. We actually practiced that a couple of times and it is really scary even if you know the guys attacking you, and you know the sensei will call it off in a minute. I was extremely surprised when one of the guys pulled my ponytail and despite the fact I technically know how to get out of that I was simply so stunned,overwhelmed and busy trying to fend off the other guys that I resorted to prying at his hand. In the end he let me go because I was having trouble breathing and starting to panic despite the fact that this was not for real. According to our sensei I had actually been fighting well. Needless to say no one ever picked on Geo ever ever again. Even if not actively competing I've noticed that martial artists in general have a sort self-confidence you don't find a lot in other people. I've often been the odd one out but while that caused me to be bullied in primary school, I wasn't when I picked up Karate in secondary school. I didn't even get in a fight but I was simply capable of looking them in the eye, grin and that would get the message across that I wasn't impressed and I didn't want to be messed with again. Frelga,may I ask what a gum is and looks like? Lebasi, the USFA rules for fencing can be found here; t.114 is on page 29 and deals with the types of penalty, etc. If you're not in the US they might be different, but at least it's a start. Thanks. I'm from the UK, but I've found it now and I passed my grade 2 fencing. Claymore wrote: Even if not actively competing I've noticed that martial artists in general have a sort self-confidence you don't find a lot in other people. I've often been the odd one out but while that caused me to be bullied in primary school, I wasn't when I picked up Karate in secondary school. I didn't even get in a fight but I was simply capable of looking them in the eye, grin and that would get the message across that I wasn't impressed and I didn't want to be messed with again. I think that's very true. Martial arts gives you good posture, confident stance, good balance, all things that proclaim that you are not prey. A cousin of mine was a large, puffy boy with a very unfortunate last name. He took up boxing. Teasing stopped. And while I don't know details, I am pretty sure he did not really beat up that many people. 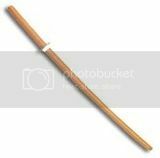 A gum is a Korean curved sword used in Kuk Sool. The real thing looks something like this. Lebasi, congrats on passing your grade! Hmm I'll probably be trashed by every Korean in the vicinity but it looks a lot like a Japanese Katana. Can you tell me the differences? Not really. From what I gather, gum is a bit wider at the tip and a tad less curved than a katana. On average. Some enthusiast websites go into more fine detail, but they tend to use Japanese terms and I can't follow them. But really, the two cultures have so much shared history (not always in a good way, but still) that it's only natural that the weapons would be similar. You bet. It always amuses me to no end that Kyokushin Karate was in fact founded by a Korean. I believe it is something of a sore spot for the Japanese. I've never done any martial arts before, but I'm going to go to a kendo practice on Monday. I'm excited! I want to try something new, but I'm of course a bit nervous since I've never done anything like that before. In the past couple of years, I've taken an interest in anime, but I wanted to do something with my new curiosity about Japanese culture other than attend anime conventions (which are thick on the ground around here). They're fun, but a bit removed from reality if that makes any sense. Of course, I'm not going to tell anyone that my interest in kendo comes from watching anime . I'll let them guess that on their own. If pressed, I will admit to playing at swordfighting with my brothers and sisters when we were younger. And learning something new like kendo sounds like a lot more fun than joining a gym, but still good for me - I should be more active.